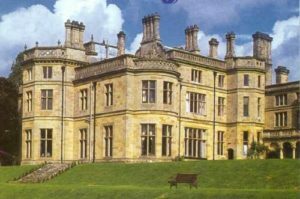 Palé Hall is a privately owned luxurious Victorian Mansion set in acres of parkland. Both our staff and ourselves are enormously proud of our Country House and Restaurant and we so want to share them with you. Lots of guests ask us about the history of the house and we thought a précis of its fascinating history and ownership might be of interest to you. The Hall was built for a Scottish gentleman, Henry Robertson, who bought the house originally sited here in 1868 and tried to restore it, but eventually demolished it and the building of Palé Hall as we know it today was completed by 1871 and remained his home until his death in 1888. It was spaciously built to accommodate his growing family and originally had 22 bedrooms, not including the staff quarters! The architect, Mr Samuel Pountney Smith of Shrewsbury, was given ‘carte blanche’ and no expense was spared. Through his profession as an engineer he first came to Wales in 1842 to survey mineral properties at Brymbo near Wrexham. So impressed were the financers by his reports about the Coal, Limestone and Iron resources of the area that they offered him the opportunity to revive the Brymbo Iron Works (last exploited with short-lived success by ‘Iron Mad’ John Wilkinson 50 years earlier). To improve haulage between the works and the quarries he promoted the laying of the North wales Mineral Railway (later acquired by Great Western). In 1846 he married Elizabeth Dean, a London Solicitor’s daughter and had one son and three daughters. In the late 1840’s he left Brymbo Iron Works under management to concentrate on further railway building. He was the engineer of the Shrewsbury to Chester line (1848) which involved building viaducts over the Dee and the Ceiriog rivers; the Shrewsbury to Birmingham line (1850); the Shrewsbury to Hereford line (1853); the Central Wales Railway and the Ruabon to Dolgellau line. Some lines were so fraught with opposition from land owners he frequently surveyed the proposed routes at night to avoid being hindered by his opponent gangs. In addition to his primary enterprises, Robertson had other commercial interests as founder partner of Beyer, Peacock & Company, the Manchester locomotive builders: Chairman of the Vale of Llangollen, Corwen, Bala and Wirral railway companies, and finally, Chairman of Minera Lime Works near Wrexham and Ruabon Coal and Coke Company. He went a step further in 1884 when after the Bessemer revolutionised steel production, he founded Brymbo Steel Works, which until recently were still in production. It was the frequent visits along the Dee Valley which led Henry Robertson to find a house in the area. He originally lived in Crogen Manor, two miles from Palé Hall (which the family still own). He loved shooting and fishing, sports for which Palé Hall was a suitable venue. Robertson was a liberal MP. for Shrewsbury between 1860-65 and 1874-75. Apart from the Railway connections, his other notable contribution to that town was his building of the Iron Kingland Toll Bridge (1879). After making his home at Palé Hall he became High Sheriff of Meirionnyddshire in 1869 and MP. for the county in 1885. However, he resigned the following year because of his opposition to Gladstone’s controversial Irish Home Rule proposals, which caused him to leave the Liberal Party. Throughout his parliamentary career he was a valued spokesman for the Welsh Railway interests. He died after becoming paralysed at the Palé Hall on 22nd March 1888 at the age of 72 and was buried in Llandderfel. Some of his papers (which include railway and engineering plans) are displayed at the National Museum of Wales in Aberystwyth. He left Palé Hall to his only son Henry, who was knighted two years later by Queen Victoria. Queen Victoria visited Palé Hall in 1889 and was enchanted by the house and the area. One walk she took along the river bank is known today as the Queen’s Walk. At Palé Hall, the original bath and antique half tester bed which she used during her stay are still in use. Sir Henry, like his father, studied engineering but after the death of his father had to shoulder many business responsibilities one of which was extending Brymbo Steel Works. He found time to become a Justice of the Peace and was a Deputy Lieutenant. He had a wide range of interests including gardening and had his own garden of rare plants at Palé. Lady Robertson’s life was mainly devoted to bringing up their seven children, three sons and four daughters. She became the first woman JP. in the county and was involved in charity work. This equipment is all in working order and is our own supply of electricity. The system was installed in 1920 at great expense by Gilbert Gilkes & Co. of Kendal. The firm is still in business and maintains it for us today. The unique piece of equipment is quite fascinating. The Turbine is powered by water from the stream at the top of the mountain. It is fed by the river into a grid, which has to be raked from leaves reglarly (every day in the autumn). From there it is piped down the hillside through two inspection chambers to the Turbine house a field away from Palé, near the river. Here the water drives the original turbine which creates 56 kilowatts of DC current from where it is brought to the house at this point. The voltage usually runs between 220 and 240 volts. If it drops below this reading we know there is a water supply problem. The amperage clock registers the amount of power that is being used at this moment in time. The house had to be rewired to AC current to comply with safety regulations. It has taken seven miles of cable incorporating approximately 440 sockets. However, not to waste this free electricity, it has been directed to heating the water, lighting the chandeliers on the ground floor, and the electric fires. It was because of this free electricity that Palé was kept in such good condition even though it had lain empty for 22 years. Eighteen electric fires were run from this equipment and were left burning around the house while it was unoccupied. Amongst the original building plans that were found in the house there was also a small box of accounts from Gilbert Gilkes & Co. to Sir Henry. They are quite fascinating especially when it was obvious that Sir Henry had made a complaint! Another interesting account is that the plugs which were supplied from Geneva cost 15/- each (75 pence). Palé Hall saw some strange days during the World Wars. It became a haven of comfort and rest in both wars, becoming a military hospital from 1914 to 1918. In 1939 the gates of Palé were thrown open once again, this time to evacuated children when a nursery school was set up. The house was sold to the Duke of Westminster in the 1950’s who purchased the estate mainly for its shooting rights over 32,000 acres. During his 22 year ownership the house remained empty but 18 electric fires were left burning in the rooms thanks to the fact that Palé generates its own free supply of electricity through a turbine driven by water. If it were not for this, we doubt if any of the magnificent original ceilings and splendid wood work would have survived. When the house was sold again in the 1970’s, restoration work began but it was not until 1984 that the house became a hotel. Back in November 1992, the house was re-purchased after falling in to a serious state of disrepair during receivership, and has been restored to its present condition at great expense by the family who bought it to be their home.